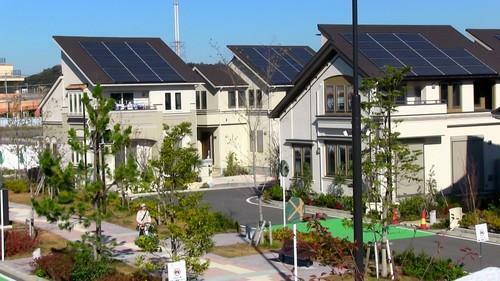 Panasonic opened its Fujisawa Sustainable Smart Town southwest of Tokyo on Thursday. Houses equipped with solar panels, storage batteries and LED lights are designed to eventually be CO2 emissions-free. As utopias go, Panasonic's new smart town works if you're keen to be green and don't mind a heavy corporate presence. On Thursday, the electronics maker inaugurated the Fujisawa Sustainable Smart Town (SST), a subdivision southwest of Tokyo focused on solar power and other environmentally friendly technologies. The community's goals include a 70 percent cut to CO2 emissions compared to 1990 levels, reducing water use by 30 percent compared to 2006 and achieving 30 percent renewable energy usage. The town is built on a 19-hectare plot along Kanagawa Prefecture's Shonan coast that once hosted a Panasonic factory for TVs and refrigerators. Fronted by a 400-meter-long series of solar panels along a thoroughfare, it now consists of rows of new, Western-style houses, each with rooftop solar panels, as well as a posh bookstore in a lavish community center. A public square centers on a giant sundial, a symbol of its aspirations. Designed to accommodate some 3,000 people when it's completed by 2018, the Fujisawa SST is already home to more than 100 households, according to Panasonic. The houses, packed cheek to jowl as is usually the case in Japan, are made by Panasonic and one of its partners and come packed with Panasonic appliances and gadgets. They feature a plethora of wall-mounted control panels and screens for energy management, security and lighting controls. Green electrical sockets indicate power outlets that can be used even during blackouts. The town's goal is to be able to provide for its own energy needs for up to three days in times of disaster, a major concern in Japan since the earthquake and tsunami that devastated the country in March 2011. The total project cost of the smart town, at about ¥60 billion (US$510 million), is reflected in the above-average costs of the high-tech homes, but they're being sold as long-term investments. "Over the total life course of the house, the cost is a bit lower than the average," said Hank Morita of the Fujisawa SST Promotion Team. There are household fuel cells, lithium-ion household battery units to store the energy generated by solar panels, tablets with software that tracks electricity production and sales to the grid operator, smartphone-controlled air conditioners and all-LED lighting. Outside, the smart streetlights, also LEDs, are equipped with sensors that can detect when people or vehicles approach so the lights are only fully on when needed. Each house is also equipped with a 55-inch Panasonic TV that connects to a community Web portal. Users can browse the latest cooking or 3D printing classes at the community center, monitor the town's collective electricity production and check the status of electric cars and bicycles available for sharing. In a "Truman Show"-style twist, the inhabitants can also watch real-time views from the town's network of nearly 50 security cameras, all monitored by staff in the Fujisawa SST management office. Roving guards called "security concierges" also keep an eye on things. Meanwhile, a mobile app called Soy Link that was created for the town allows locals to swap information about shopping, crime prevention, social gatherings and sharing assets like kiddie pools. Panasonic, which leads a consortium of 18 companies backing the town, wants the houses to eventually have zero CO2 emissions. At the opening ceremony, hopeful executives remarked on the auspiciousness of the sunny skies and a snow-clad Mt. Fuji clearly visible in the distance. They noted that Thursday marked the 120th anniversary of the birth of Panasonic founder Konosuke Matsushita, a revered figure in the company. "This town is going to exist for 100 years as a sustainable town," Masahiro Ido, director of Panasonic's Business Solution Division, told attendees.